The ELZU external belt driven actuator consists of two Y-axes and single X-axis, driven by one rotating belt. This belt runs around different deflection pulleys. Positioning is achieved by two motors. The coordinate is diagonal to the deflection points of the Y-axis. Advantage: A smaller amount of inertia is needed, thus enabling high accelerations to be achieved. 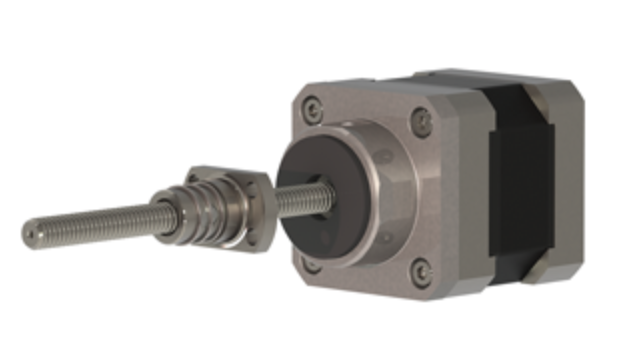 Nook’s modular ball screw stepper actuators are available in two styles, rotator and a captive. The rotator is the base unit for the captive unit, and the captive option adds an extruded body and keyed nut adapter with extension tube. This option also adds the ability to install travel limit switches. A rubber retract stop bumper is included to prevent accidental over-travel. The products also include an external ball bearing to absorb additional axial forces. The modular ball screw stepper actuators come with either NEMA 17 or NEMA 23. The NEMA 17 option utilizes Nook′s 6mm x 1.25mm lead stainless steel ball screw assembly with the new 3-circuit ball nut assemblies. The NEMA 23 option utilizes Nook′s 10mm x 2mm lead stainless steel ball screw assembly with 3-circuit ball nut assemblies. Nook′s mini stainless steel ball screw actuators are available in standard and enclosed options and feature exterior components made from FDA approved materials, such as 300 Series stainless steel. The enclosed version is designed to meet FDA guidelines capable of attaining the IP69K wash down rating. The application makes for easy navigation when searching for design considerations for worm jacks, bevel jacks, electrical cylinders and bearings. Simply plug in the desired specifications, and the app will provide a list of products best-suited for the application. "DesignGuidePro puts the formulas right in the palm of your hand in an easy-to-use mobile app" said Ronald Giovannone, project manager at Nook Industries. "Nook is known for providing engineering support for linear motion applications, this app is one more way that we can help our customers keep moving." Nook can provide you with a new slide system or a replacement for any slide purchased through others in the industry. We've built our reputation in linear motion by holding our products to the highest standards and our commitment to providing complete system solutions. Nook Series 200 Precision Slides can be supplied with Stepper Motors, Servo Motors, Stepper & Servo Drives and Motion Controllers.